Yes, this movie is a tear-jerker but also bears the mark of a well thought out script with twists and depth that will appeal to the intuitive viewer. After the death of his six year old daughter two years earlier, Howard is racked with grief and struggles to integrate back into life. The recurring motif of Howard knocking down domino tracks (set up weeks in the making) by a single flick of the first domino, becomes a fitting metaphor for how his life had been shattered in a single moment by the death of his daughter. Withdrawn and empty, Howard writes letters to the abstractions of love, time and death as he tries to fix his mind. When Love, Time and Death reply in human form, Howard begins to question his sanity and so do others. But as this story intricately breaks its way through Howard's emotions, three work colleagues who are concerned for their friend and boss also unexpectedly benefit from the wise counsel of Love (Kiera Knightly), Time (Jacob Latimore) and Death (Helen Mirren) adding sub-plot lines that beautifully interlock with Howard's grief issues. Kate Winslet plays the role of Claire and connects with Time, as she has put her life on hold for her career instead of pursuing her desire to start a family. Edward Norton as Whit connects with Love as he deals with the guilt of not feeling deserving of his daughter's love after his divorce. And Michael Pena in his role as Simon will tug at your heart strings as he connects with Death, and a serious secret he has been hiding must be revealed. This truly is a heartrending story and with such a brilliant cast the quality is superb, enticing for the eyes as well as the heart. Helen Mirren is captivating in her role as death, and though death may be expected to be morbid, she brings a beautiful balance of humour and light-heartedness along with deep concern and thoughtfulness. 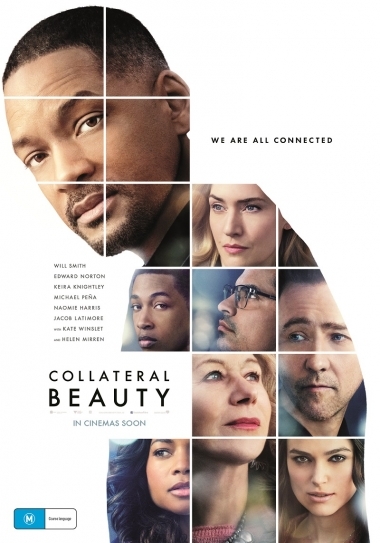 Investigating the idea on different levels that beauty exists and is still to be found even in the darkest of circumstances, Collateral Beauty leaves the viewer with a challenge that lingers long after the movie has ended. Where there is pain, love still exists, time is a gift not to be wasted and death makes us treasure what we have. Rebecca and her husband Tony, have four children and live on the Sunshine Coast, Australia. 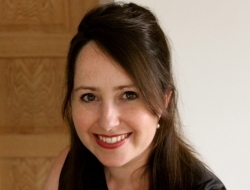 Rebecca loves writing children stories, interest articles and teaching piano. She is grateful for a God who loves us.